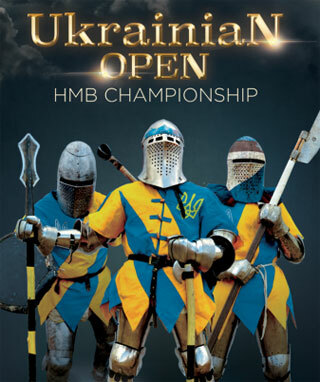 On 15th of December 2018 in Kiev will be held Ukrainian Open HMB Championship - championship of Ukraine in historical medieval fights. The venue of the event is Meridian Sports Complex and working time: 11:00 - 22:00. For guests of Ukrainian Open HMB Championship are waiting duels of knights in real steel armor who will compete for a place in National Team of Ukraine. More than 150 fighters from different parts of Ukraine will compete in 5x5 and 12x12 full-contact battles. The area of children's fights will be operated by soft swords and shooting range for small archers. During the fair of medieval goods and attributes it is possible to choose a unique souvenirs for good memories about the event. Ukrainian Open HMB Championship is the event that leads to world level event - IMCF World Championship on Medieval Combat that take place on 16.05 - 19.05.2019 in Kievan Rus Park.